Print Club open studio. Photo by Anthony Alvarez. It might seems like yesterday when $187 per month was enough for Lisa Conrad to lease an art studio out of 585 Broad Street in Newark. But it was actually six years ago, and a lot has changed since then. Conrad, the founding Executive Director of Newark Print Shop – a community printmaking facility – is experiencing those changes firsthand as she searches for a fourth location for her grassroots operation. With the economic rise and recent developments in the city of Newark, finding a new space has become a challenge for Conrad, whose current lease expires at the end of the year. It was 2012 when Conrad began opening up her studio on Wednesday nights to provide space and tools for other artists to create art and share their love for printmaking. According to Conrad, the concept of creating art with other artists came organically, and the workspace became known as Print Club. Print Club was created in a space that was affordable, but Conrad explained that spaces like this no longer exist. Despite her current dilemma, Conrad said that the Newark Print Shop has progressively grown overtime and has been fortunate. In fact, the current location at 56 Halsey Street launched in February of 2017 as a resident community partner with Express Newark. Alicia Banks and Candy work on their designs at Newark Print Shop. Photo by Teanna Owens. Newark Print Shop at Express Newark in the Hahne’s building. Photo by Teanna Owens. According to Conrad, Newark Print Shop’s current location is in a much more clean-cut, institutional setting. 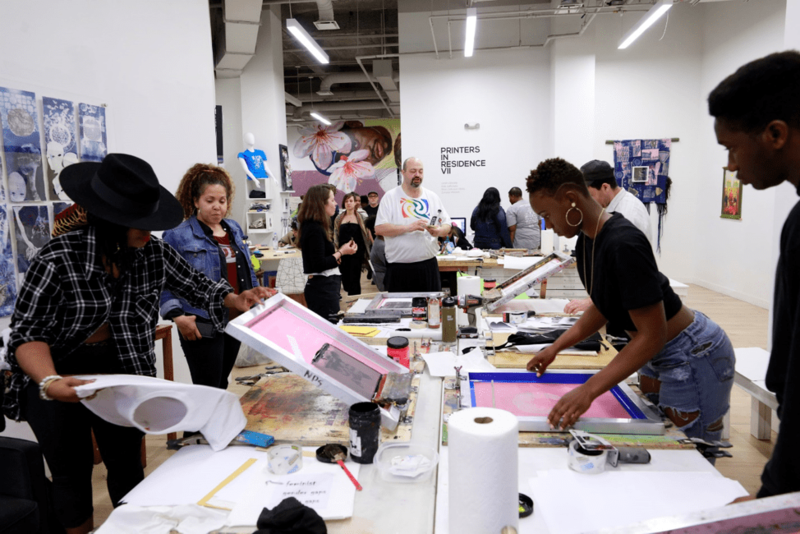 Located on the second floor of the newly renovated Hahne & Company Building, Newark Print Shop’s current space provides an open and welcoming setting to regular and first-time visitors. Last Wednesday was Jah’s first time at Newark Print Shop. Jah heard about the shop on Instagram, and after finding challenges with his local Brooklyn print shop, he decided to come to Newark Print Club to do some screen printing on kids’ t-shirts. When asked of his experience thus far, Jah said it seemed like a creative, laid back space. Golding said most people that come to Print Club are there to make t-shirts, adding that seeing so many people come in to make shirts has inspired him to do the same. Alicia Blanks and Candy have been coming to Print Club for a few months now. They were there last Wednesday making dresses for their company, Miss Diamond Shine America. Despite having difficulty securing a new location, saying good-bye to the print shop is not in the plans for Conrad, who envisions the Newark Print Shop being a longstanding art and cultural institution. While a lot of Conrad’s time has been spent meeting with developers and trying secure a new place, leaving her little time to create art, Conrad said that Newark Print Shop is her life’s dream, and she wouldn’t have it any other way. Teanna Owens is a 2017 graduate of Montclair State University, where she studied English literature and Journalism. During her undergraduate years she was involved in her school’s student run newspaper, The Montclarion as the Feature Editor and a contributing writer to over half a dozen stories. Teanna is excited to begin her freelance writing career with Brick City Live and looks forward to writing about the people and places of the city where she was born and raised.